Under Scots Law, an offending statement may not always be defamatory as it can fall within another category of hurtful words i.e. malicious falsehood or slander of title. To be defamatory a statement must be false and must lower the defamed in the estimation of right thinking members of society. A court will establish what that standard is today when considering the statement. Additionally, it is important to remember that to accuse someone of making defamatory comments may, of itself, be defamatory. For an action to be raised the alleged defamatory statement must be communicated. The traditional forms of communication are publication in print or oral dissemination. However, nowadays the number of platforms on which communication can occur have increased. Online social platforms such as, Twitter, Facebook, LinkedIn, and the numerous blogging platforms, have increased the modes of communication where a defamatory statement can occur. February of this year provided us with a high-profile libel case initiated over words posted on online social platform, twitter. Monroe v Hopkins provided us some valuable guidance on how to keep on the right side of the law when writing online. You might think that you have posted a light-hearted tweet or a funny response, but it may not come across as that to the receiver and you could be opening yourself up to potential law suits. 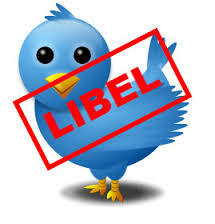 Do tweets fall under the definition of defamation at common law? If so, have the tweets caused or are they likely to cause serious harm to the reputation of the claimant? Hopkins sent a message accusing another of vandalism of a war memorial, but the tweet was directed to the wrong person. A simple case of mistaken identity which Hopkins attempted to rectify by deleting the tweet two hours after it was published. Mr Wilson, Hopkins lawyer, argued that: “The readership would have been limited because the tweet was a reply and deleted after two hours, and that readers would understand it was a case of mistaken identity” and “Ms Hopkins lawyers have argued that Ms Hopkins is well-known for being confrontational, outrageous and flippant and that therefore the allegations would have been taken with a pinch of salt”. Therefore, although no official defence was lodged it was argued that the tweet did not constitute a defamatory statement. “whilst the claimant may not have proved that her reputation suffered gravely, I am satisfied that she has established that the publications complained of caused serious harm to her reputation”. “Which implies that this judgment could apply to twitter accounts smaller than Hopkins’. This case provides us with valuable information that no matter how viewed your online platform is or how long the alleged defamatory statement is published, you can still be tried for defamation. If this case tells us anything; it that you should consider the way in which your online publications can be construed. Hopkins could easily have avoided this if she published an apology to Monroe. A simple request.